Last week, Matt Burke walked into our office. He walked in with a CV and asked for work experience. He nailed it. Amongst all the emailed CVs that were frankly copies of all the other ones, Matt’s was relevant to us and he stood out. Not just because he came into my office, but because there was something about him. The way he talked, presented himself, and the way he lit up the room when he spoke. It’s funny to think he’s only 19. I have a theory. I believe it’s because Matt does a LOT of video. I think you should too. Imagine what it could do for your business if you had more confidence and presence when you pitched an idea! I wanted to learn more about how Matt creates his videos but also why many simply won’t do it and why they’re scared to try. He honestly told me he was scared at the start, too. Video, the content we all love to watch but not enough of us create. More than ever, businesses are at a stage where they need to have an edge on their competition. The stakes are high and growing a business is difficult, but have you ever thought about integrating video content into your strategy? It can really give your audience an insight into who you are, the person behind the email. You may have the best product out there, but it’s all about building relationships in the community. Usually this can be done at networking meetings, but why not let your fellow networkers meet you before they see you in person? Video is a great tool for this. It allows you to control how people view you. With video you are saying it how it is. Most videos aren’t scripted, and if they are, they shouldn’t be. The more natural, the better, as this allows your audience to engage more with the person you want to display. It’s a massive confidence builder. You will start to find that in face-to-face situations you are far more confident, as 100s or even 1000s of people will be judging you behind their screens whilst watching, and you’ll start to get used to that fact. Therefore when it comes to one-on-one situations, you’ll own the conversation. Video can be a great tool to sell a product. If done correctly, you can cleverly push a product in a video. Now, you don’t want to force the product down the viewer’s throat, but if you show your personal interest in the product, people are more likely to be intrigued. Got a product that’s being released next year? Or an event that needs additional marketing? Video is the perfect tool for this; use it as a way to give people an insight into the work that goes in behind the product, or how difficult it is to orchestrate an event. Don’t let all the hard work you put in go to waste – document it and give your audience a unique experience of the story of how you got from the drawing board to the final product. 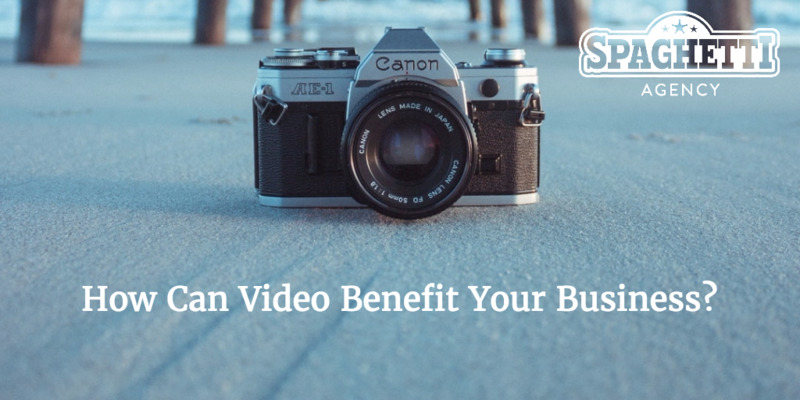 So, you’ve realised the benefits video can bring to your business, but where do you begin? It’s easy: pick up your phone and start filming. No script, no professional setup – all you need is an idea. Throughout all filmmaking, the story is the key part. Without a story you can have the best kit in the world and no one will watch. You need to take the viewer on a journey and get their interest. As a beginner, focus on yourself! It seems weird at first to talk about topics you have a passion for, because you think no one else will be interested but people will feed off the passion you have for said topic. A lot of people get bogged down in camera gear, and believe me it’s a minefield of overpriced, underused equipment. So here are some valuable pieces of gear you can use for your videos. Everyone owns a phone, and it probably has a very good camera. Use this at first before committing to buying a better camera. Anything of this type is fine. The Bluetooth control allows you to set up the shot and remotely start recording. This will prove very useful the more you record. Free – We all have those books in our office, collecting dust. Stack them up in a pile and use that as your tripod. I kid you not, my very first tripod was built like this and I used it for a couple of months. God forbid I actually read any of the books, so at least they served a purpose! Video deserves a level of quality, and little touches such as good sound go a long way with video. It shows effort on your behalf, which the viewer respects. Microphones range massively in cost, but for a basic starter this one is perfect. There’s a problem… IT’S YOU! A massive issue in video is that people don’t have the confidence to get in front of a camera. Now, most of us don’t like having our picture taken without being warned before, so we can adjust our hair etc. However, this shouldn’t be the focus of the video. You can’t change how you look, so why care what people think of you? It’s impossible to please everyone and people are always going to have mixed opinions, but what most people value is confidence! Be yourself in front of the camera and it will say a lot more than someone who’s spent hours on their appearance but is boring to watch. The more you record yourself, the less you will care about other people’s perceptions and the more you can start throwing yourself into the quality of your content. As soon as you overcome that barrier your videos will sky rocket. How to overcome recording yourself in front of people? JUST DO IT. There is no other way; you have to put yourself out there and get the camera rolling. It all comes back to the fact that you have to talk about something you’re passionate about. You may hate the process for the first minute of recording yourself, but once you get into the subject you’re interested in then you’ll find yourself really enjoying making the video. However, I realise that not all people can see past that bit of hair that won’t sit perfectly and so give up on the video. So, for the vain audience out there, here are three YouTubers who aren’t the best looking but are earning a fortune from not caring. YouTube’s number 1 creator, Casey Neistat, is commonly known as the king of YouTube. The content this guy creates every day is phenomenal; he takes the viewer on a journey around the city of New York and has grown massively in the last two years. Perhaps he’s not the best-looking guy, but would you care if you were making around $400k a year on YouTube? An English YouTuber famous for his comedy skits, JaackMaate is one of the biggest ‘comedy YouTubers’ but is also commonly known as one of the worst-looking creators on the platform. However, this hasn’t stopped him from bagging interviews with comedians such as Ricky Gervais over the past few years due to his YouTube fame. Arguably one of the funniest YouTubers there is, Ed has built his channel on his rather odd appearance and now has many different characters that he’s developed with various costumes and looks. Most of them are very ugly indeed, but people love his videos and find his content hilarious! He’s embraced his ‘bad’ looks and made an opportunity out of it. I hope that’s given you an insight into how important video is in your company. There should be no excuses – pick up your camera and start now! Thanks to Matt for blogging this week. Check him out right here if you want some more of Matt Burke. Great article – you’ve inspired me to do it!! I’ve just embarked on video – so now I just need to take action and start . Thanks Matt – great article! What an interesting & confused world we live in nowadays. My eldest son (22yrs) has just graduated from university & is like a lost sheep when it comes to applying for jobs online/emailing CV’s. Being old school (or just old), I suggested he design his CV (he’s a Fine Art Graduate & computer literate), print it out on some lush paper stock, pop it in a deluxe envelope & post it or hand it in himself….Which he did. He starts 6 weeks paid work experience with the prospect of a permanent position with a large add agency next week. They loved the tangible CV rather than the 100’s of emailed one’s they receive weekly & invited him in for a cuppa. It seems whilst everything we do is online & virtual these days (especially Add Agencies), there’s nothing like face to face to discover there is “just something about him/her”. Well done Matt Burke, you ‘get’ what so many of are missing. Great to hear his story. The old ways still work, more so in many cases because everyone else has stopped using them and that makes you stand out! I’m finding that more and more the old ways are coming right back! Excellent! This reminds me of the story of someone trying to get the attention of a big company, so they created a parking ticket and placed it on the MD’s car! You’d open that!